A unified graphical debugging environment within Cadence® Incisive® Enterprise Simulator, Cadence SimVision™ Debug supports signal-level and transaction-based flows across all IEEE-standard design, testbench, and assertion languages. It also supports concurrent visualization of hardware, software, and analog domains. SimVision Debug can be used to debug digital, analog, or mixed-signal designs written in Verilog, SystemVerilog, e, VHDL, and SystemC® languages or a combination thereof. SimVision integrated debug supports signal-level and transaction-based flows across all IEEE-standard design, testbench, and assertion languages, in addition to concurrent visualization of hardware, software, and analog domains. 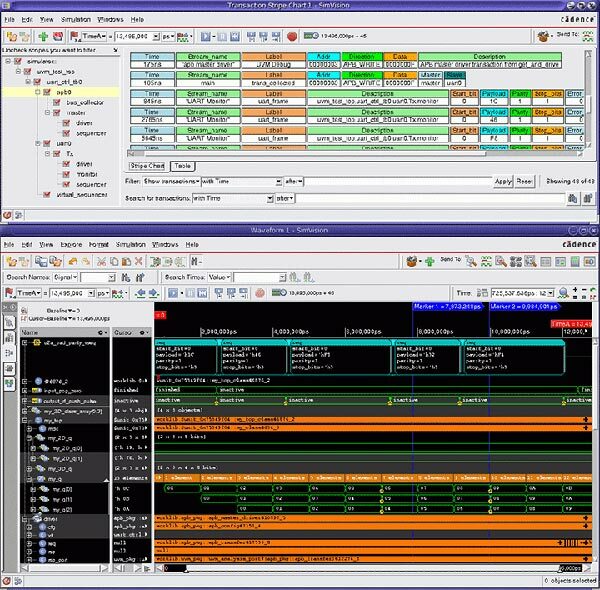 SimVision Debug provides a unified simulation and debug environment that allows Incisive Enterprise Simulator to manage multiple simulation runs easily and to analyze both design and testbench behavior at any point in the verification process—regardless of the composition. 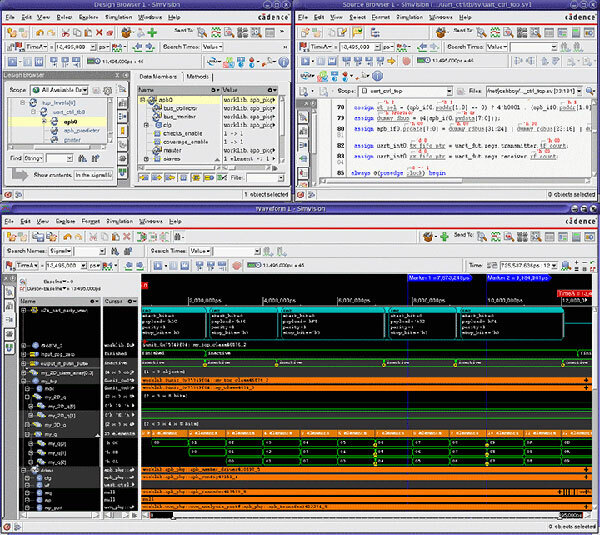 Throughout the design and verification flows, SimVision Debug provides source browsing, transaction and mixed-signal waveform analysis, complete code/transaction/ assertion coverage analysis, integrated display and debug of power behaviors, hardware analysis checks, and seamless connections to downstream implementation flows. APIs based on industry standards are available at all levels to enable user-defined checks and analysis. Design and testbench models can be interleaved in any language and any level of abstraction without the performance and integration overhead caused by co-simulation. The Waveform window, which plots simulation data along an X and a Y axis. Data is usually shown as signal values versus time, but it can be any recorded data. The Memory Viewer, which lets you observe changes in the internal state of memory locations. During simulation, it also lets you set breakpoints, and force and deposit values to memory locations. The Expression Calculator, which lets you define expressions, which combine signals to form buses, conditions, and virtual signals. The Schematic Tracer displays a design as a schematic diagram and lets you trace a signal through the design. The Memory Viewer lets you observe changes in the internal state of memory locations. During simulation, it also lets you set breakpoints, and force and deposit values to memory locations. Multi-language, mixed-signal support: SimVision Debug supports all IEEE and Accellera standards for digital, analog, or mixed-languages (Verilog, SystemVerilog, e, VHDL, SystemC/C/C++, or a combination). You can leverage SimVision Debug from the Virtuoso and/or Incisive environment. Analog and mixed-level behavioral abstractions of wreal, SystemVerilog reals, Verilog-AMS, and Verilog/VHDL are also supported. 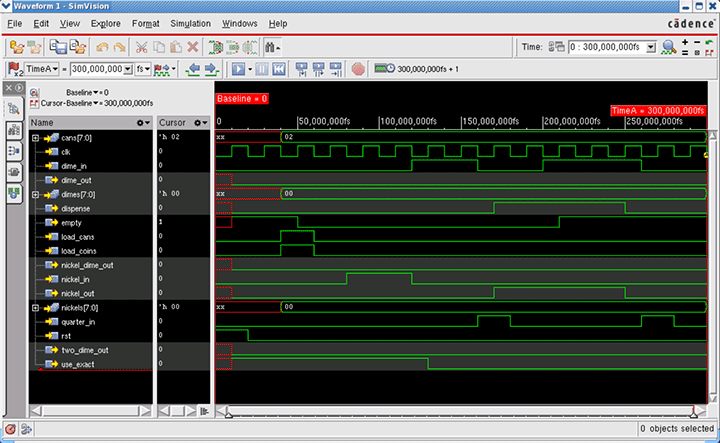 Walk-up connections: SimVision Debug can “walk up” to any running simulation, allow you to interactively debug, and then detach from it to continue the simulation. e/SystemVerilog class-based debug: SimVision Debug offers interactive and/or post-process debug that supports OOP/AOP class-based debug environments. It supports full Logical Path Name as well as unique class object handles (direct handle to object in memory). SimVision Debug also provides many innovative visualization capabilities to debug dynamic data in post-processing mode. UVM awareness: Since the Universal Verification Methodology (UVM) defines class-based, transaction-driven testbenches, you need a debug environment centered on these elements. SimVision Debug enables you to access the environment through both the class inheritance and the instance trees. You can follow the simulation flow single-stepping through/over lines, method calls, and even into macros. Transaction analysis: If the testbench uses transaction recording, debug becomes even easier. UVM provides automatic transaction recording so that you can view your test sequences. SimVision Debug adds a novel stripe chart view that allows you to visualize the sequential order of transactions across multiple streams. Macro debug: SimVision Debug simplifies UVM debug by giving you visibility into expanded macro code, in-line with your source code while retaining original formatting. It also identifies nested macros, expands/collapses macros, and debugs annotated values for all macro variables. Check out the SimVision Debug video series on our YouTube channel for additional insights.